Plain is a simple and easy to use Responsive Shopify theme; meaning it will work great on computers, tablets and mobile devices. The theme comes with a wide range of theme settings that are easy to customize, ready to use, and waiting for you to put your own spin on the theme to make it stand out. Fully responsive, so it looks great on a desktop, tablet or mobile device. Upload you own favicon for a consistent branding throughout your site. Upload your existing logo, or create your own with an array of different font settings. Upload a custom background or use a color of your choice. Make use of 50 of the most popular Google fonts around. Create drop down menus two deep for better organization of your site. Upload images on the home page to create a rotating banner. Showcase a collection right on the home page. Customize fonts throughout the site. Change buttons, and link colors to match your color scheme. Display 2, 3, 4 or alternate between 3 and 4 products per row. Display related products on your product pages to increase sales. Fully integrated with social media throughout the site. 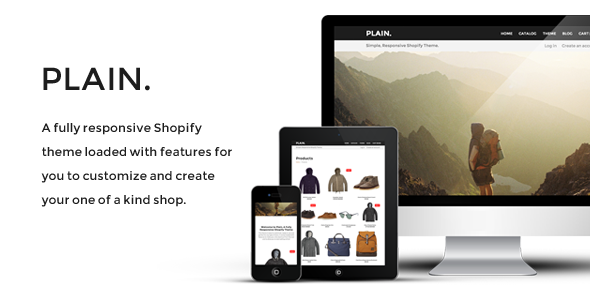 Item Reviewed: Plain - Responsive Shopify Theme 9 out of 10 based on 10 ratings. 9 user reviews.